This project departs from a thousand year old epic poem by the Persian poet Ferdowsi called the Shahnameh (i.e. The Book of Kings): 60,000 lines of verse that embody the pre-Islamic culture and history of Iran better than any other single source, by creating the most comprehensive collection of Iranian mythology from over 2000 years of history, and rigorously setting it in a highly literary and referential Farsi language. Our goal is to bring the remarkably ageless quality of this text and its insightful analysis of Iranian culture and politics into contemporary light, as a way to question, critique, and complicate the wide range of presumptions that color civic and political relationships between Iran and the US. In this project, gesture is transformed, multiplied, and scaled to create an immersive storytelling experience. The layers of gesture include movements by the lead performers, complementary gestures expressed in the live animation and the large scale coordinated aerial robotic choreography. The human, robotic and media elements in this work together create an orchestra of gestures: the audience will experience a virtuosic dancer whose body movements and hand gestures are intimately tied to the animation in the large panoramic projected image, as well as the complex aerial choreography of squadrons of flying robots. We intend to develop this work closely with a virtuosic dancer practiced in a highly theatrical and physically rigorous movement style. 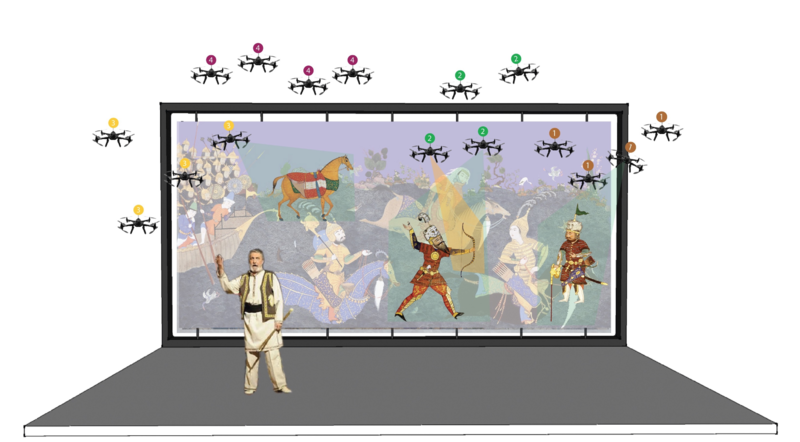 The movement concept is inspired by the tradition of Naqqali, a dramatic storytelling practice that dates to the 7th century CE where the morshed--generally a male master storyteller--strolls in front of a mural and recites tales of legends while pointing to specific elements in the image. We have developed a system that allows a performer to use bi-manual gestures (freehand on the right, and a wand in the left hand) to communicate with the robotic and animation system using a customizable grammatical gestural language. Support from MAP will allow us to work closely with a performer to train this interactive system while we refine the movement language of the show as a whole. Our work delves into the battle between Rostam and Esfandiar, one of the literary highlights of the Shahnameh featuring the epic’s hero and his princely disciple. This story is characterized by the intricacies of political ambition and familial allegiance that surround an empire undergoing change. This story also contains numerous mythological archetypes shared across canonical texts from the east and the west, like the firebird and the invincible warrior with a one weakness. This references serve as cross-culturally legible symbols that connect this story to mythologies from around the world and engage a wide range of audiences in the work. The past decades have brought tremendous media attention to Iran, its internal politics, and its influence on regional and global politics. The Iranian Revolution of 1979 and the hostage crisis shortly thereafter,the brutal 10-year war between Iran and Iraq in which the US aided both sides in demolishing one-another, the Iran–Contra affair, the rise and fall of Iranian presidents from both sides of the moderate-to-hardliner (Khatami-to-Ahmadinejad) spectrum, and most recently the polemic nuclear peace accord presented by the Obama administration: each event has contributed to a growing polarization in attitudes towards Iran and its people. Experiencing the Shah-nameh today is therefore a cultural and political experience, rooted in a centuries old tradition of translation and preservation, of a culture--Iranian--that is connected yet separate from much of its surrounding context--the Arab muslim world.